On a beautiful Wednesday, Nov. 10th (2010) King County Executive Dow Constantine hosted a 1pm press conference on the shores of West Seattle with the waves clapping against the bulkhead. Amongst tears and hollers of joy, historic words were spoken. The deserving stars of the day Dow Constantine, Sharon Nelson, Peter Goldmark and many others stepped up to the podium. Even the conflicted Jan Drago had some quaint though somewhat vague remarks that sounded more like a farewell address. CalPortland's Ron Summers, who less than two years ago claimed that nothing would keep the mine from expanding struck a sportsmanlike tone. Of course - $36 million is not $65 million, but it's not chump change. It was fascinating to see everyone come together. It was also typical that the only folks not actually invited were the rabble (us). Luckily, I found out about it by chance, fetched the puppet and headed in. I have discussed and speculated about only a tiny part of a thirteen year struggle. This fight had so many chapters, fronts, and flanks. Many others have been engaged in the fight longer than I and can tell their version of the story better than I. Though the various flanks in this fight did not always work in perfect harmony, they did in my opinion (and some more politically minded would disagree) never work at cross purposes. It is already an amazing case study of the inter-relationship between legislative, litigation, acquisition, and direct action flanks; and how each has a vital role in delivering victory.As a reporter confidentially said to me two days before the Martinez decision against Glacier in August of 2009 - "this battle will be decided in the court of public opinion. And we both know where that is going." I wasn't so sure. But in hindsight - I can see that he was right. Here is, in chronological order (top to bottom) description of the grassroots direct action campaign and how it interwove with political and legal developments. I've included articles of the last couple years and a sampling of the earned media received since the Sutherland quid pro quo lease was granted. I believe it is an inspiring and instructive outline of how the direct action campaign can turn the tide for community interest over corporate power. I hope you enjoy the journey - and figuratively or literally see yourself in the pictures. E.D. Backbone Campaign and proud member of the Mosquito Fleet. Vashon Beachcomber, July 9, 2008. "Maury Island mine expansion OK'd"
Seattle PI, Dec. 2, 2008. It looked like they had us licked. Legislation to protect Maury Island and failed. Glacier received their Permits from Feds. And then outgoing State Lands Commissioner Doug Sutherland approved a lease of State aquatic lands. Ultimately, long-time community ally County Executive Ron Sims felt he had no choice but to capitulate and grant Glacier a permit for construction, as they had obtained all other permissions and failing to do so would only trigger another lawsuit that the County could not afford. Glacier had all the momentum in the courts and in the press. Governor Gregoire wouldn't lift a finger and David Dicks (son of Congressman Norm Dicks) head of Puget Sound Partnership thought it was not a priority, ad a "fait accompli." We were outraged by the lease of supposedly State protected, public aquatic lands to the mining company by outgoing State Lands Commissioner Doug Sutherland in an obvious quid pro quo for the $50k campaign contribution he received from GlacierNW. Backbone Campaign and Preserve Our Islands organized a first in a series of demonstrations. Here's our Press Release for that morning. Knowing that the off-island press wouldn't send reporters to a small demonstration on the remote beach, we scheduled it during the AM commute, made a giant sign and called the traffic helicopters. KIRO took the bait. Protesters barricaded two Maury Island roads at dawn today, hoping to stop construction of a loading dock for a gravel mine. After delaying work for a number of hours, the workers eventually found another way in. When the nine people who were locked down decided that we had achieved our goals of delaying work, getting press attention and inspiring the community, we dissolved the blockade. Everyone immediately went to a meeting where we got to work turning out people and building banners for the rally that was scheduled for two days later. The Governor's office finally started to return Backbone Campaign calls and gave us a meeting with a representative of the Governor. Regional environmental organization leaders also asked for a meeting and got one, with Gov. Gregoire. We were playing an important role as agitators that made others look more reasonable. And to the public - we more or less looked like them. "Fourteen legislators on Monday sent a letter asking her (Gregoire) to suspend and possibly overturn a state lease issued in early December that cleared the way for a major expansion of the mine. The appeal thrusts Gregoire into an issue that has prompted years of lawsuits and, most recently, a protest by hundreds of mine opponents this past weekend." The Mosquito Fleet direct action campaign continued to delay work, earn attention See Seattle PI article and photos HERE. Activists on Vashon had planned to serve a cake in the shape of Maury Island with a Tonka truck outside the Governor's inauguration, but restrained themselves when called by certain leaders, concerned about embarrassing Governor Gregoire. Those same people deftly mentioned their request during a meeting with Gregoire saying, "We cannot keep them at bay forever." Backbone Campaign actually led two delegations to Olympia in the time between winter and summer actions. The first was to the Governor's office in which members of the Mosquito Fleet (Aleythea Dolstad, Logan Price and Nick Simmons), Prof. Patrick Christie of UW and POI, and Rick Dahms of Dockton Water joined Bill Moyer to deliver a message that our community expected better leadership from the Governor, that we were better allies than adversaries (showing them the media coverage we had earned), and that we recognized the monumental shift in orientation from extraction to sustainability was hard, but essential. After a spring of touring, Backbone Campaign re-contacted Keith Phillips at the Governor's office to express our disappointment that she hadn't responded to any of our requests. We warned that our resolve was unshakable and that we'd be hosting a training with the very same trainers who organized the 1999 WTO shutdown in Seattle. We reiterated that the only real solution was for the land to be purchased. We also shared that we were concerned that the Governor might not be doing everything she could to make that happen. We were later informed by a friend at an island agency that the King County Sheriff's office had been asked by the FBI to keep an eye on our upcoming camp. We then launched a petition to the Governor demanding leadership. We were firmly requested not to pursue or deliver it by those concerned with embarrassing the Governor. We also started the GreenJobsNotGravel.org web survey. For the second Olympia delegation, Backbone enlisted librarian Rayna Holtz (organizer of Low Tides festival and proposed Beach Stewards program), Steve Graham (community council's Septic Solutions committee) and high school science teacher Tom Devries to visit Bridget Moran, the new head of State Aquatic Lands. They delivered the message that the Vashon-Maury community is an excellent and able partner in ensuring the Aquatic Reserve program is successful. Backbone delivered the message that DNR credibility hinged on not allowing an industrial gravel mine in an Aquatic Reserve. We spoke about Maury Island as the "pivot point" in the shift toward a regulatory system modeled on sustainability rather than extraction. "Goldmark, in a two-page letter to Glacier issued late Tuesday, said his staff has carefully reviewed the lease and determined the company has not submitted sufficient information to demonstrate lease compliance." Coverage of our July 2009 Training to Confront Glacier's Continued dock construction. Our LocalizeThis! Action Camp and the on-water rapid response squad was our 800lb. gorilla. The efforts were a collaboration between the Backbone Campaign, Mosquito Fleet, Ruckus Society, and Indigenous People's Power Project. We worked hard to get the press to cover it so that we could broadcast strength, resolve and a principled commitment to our community and the Puget Sound. The coverage demonstrated that we were truly winning in the court of public opinion. "Tough choices in the recovery of Puget Sound"
"Sometimes we may have to say no to proposed uses if such activities would threaten the recovery of the ecosystem. What we are witnessing is death by a thousand cuts. It has been all too easy to allow new uses with a slight impact on the health of this tremendous body of water and the orca and salmon that call it home. Far too much is at stake to continue on this path. We need to raise the bar immediately." Leading up to the Aug. 15, 2009 demonstration, Mosquito Fleet and Backbone Campaign organized furiously. We tracked barge and tugboat movement and organized the rapid response squad to intercept the arrival of the construction barge to prevent the continued building of Glacier's barge-loading facility. We had two safety boats, high powered flashlights, and 40 volunteers trained and on alert to be on the water within 1 hr. 24/7. 40 kayaks stood ready. "Federal judge rules against Glacier, halts pier project"
"Judge rejects Maury Island gravel-mine permit"
Here Mosquito Fleet activists speak about their commitment and actions, while a banner translated into traditional script sends Glacier's Japanese parent company Taiheiyo a message of stewardship. More related video courtesy of Mark Corliss. 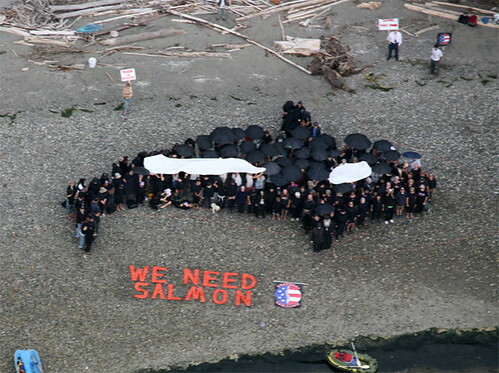 200 plus people, dressed in black and holding umbrellas form a human mural of an orca whale. Great music, speeches, and hot dogs were enjoyed by all. Kathy Fletcher of People for Puget Sound's analysis on this ruling's broad significance to Puget Sound. US District Court Judge Ricardo Martinez's ruling against Glacier and Army Corps of Engineers sent the company back into a multi-year Environmental Impact Study process. It was a victory in a battle, but the fight went on. The Army Corps of Engineers did not appeal. Glacier soon abandoned their appeal as well, but re-started the EIS process. "State budget plan has money to buy controversial Maury Island gravel mine"
The Army Corps began a scoping process for EIS. Amy Carey of POI fought for more community notice and won a delay. Backbone Campaign handed out Mosquito Fleet T-Shirts. Even the representatives from the Army Corps wanted them. Mica Gaxiola famously finished with warning/promise that if Glacier attempted to restart pier construction, "There will be kayaks!" Take Action Puget Sound - You Are About to Be Screwed! Nov. 8 - King County Council was scheduled to vote on an update of the Shoreline Management Plan. Glacier seemed to have the votes to include a "mineral resources" exception to the "natural" (i.e. protected) shoreline designation favored by County Executive Dow Constantine. Glacier had hired a former consultant of interim Council-member Jan Drago to lobby the council. Citizen outrage foiled Glacier's plans and the Council sent the SMP back to the Transportation and Environment committee. This delayed the vote until Drago was replaced by Council-member elect Joe McDermott, who actually represented the Vashon-Maury community. Together, we defeated the mining company's last best chance! On Nov. 10, 2010 a Press Conference was called to announce the monumental news that Glacier's parent company CalPortland (a subsidiary of Taiheiyo Cement of Japan) had signed a Purchase & Sale agreement with the Cascade Land Conservancy and King County to sell the land to the public for $36 million. When completed, this will establish the largest protected shoreline in Puget Sound and a 250-acre park.